Winemakers are increasingly utilizing the complexity of volcanic soil to take their bottlings in bold new directions. We talk to industry pioneers about what this trend means for your wine. Just one-percent of the world’s surface is covered in volcanic soil, but more and more vineyards are cropping up on this ash-enriched earth. We’ll meet the man who’s heating up the volcanic-wine movement with an exciting annual event. We’ll find out why it isn’t just volcanic wine’s soil that’s complex. And we’ll hear from some of the most celebrated producers in this burgeoning wine movement. Marina Vataj: From Wine Enthusiast Magazine, this is the Wine Enthusiast Podcast. I’m Digital Content Director Marina Vataj. Coming up: volcanic wines. Just one percent of the world’s surface is covered in volcanic soil, but more and more vineyards are cropping up on this ash-enriched earth. We’ll meet the man who’s heating up the volcanic wine movement with an exciting annual event. John Szabo: You know there’s something there, why don’t we turn this into something a little bit bigger. Let’s make it a conference. Let’s turn it into a movement. MV: We’ll find out why it isn’t just volcanic wine’s soil that’s complex. Sofia Perpera: Everything about wine, it’s not just a drink that you have in a glass. It’s the whole story about it. It’s the people, it’s the culture, it’s the place. MV: And we’ll hear from some of the most celebrated producers in this burgeoning wine movement. Christina Boutari: When I usually go to tastings and talk about Santorini I feel very unique talking about the volcanic island, but here today, we’re in a room where it’s, every wine is from a volcanic region. MV: It’s coming up on the Wine Enthusiast Podcast. We’ll start today’s show in New York City. John Szabo: Thanks so much for coming. I know New York is an amazing city, but there are always a good 300 tastings going on, and we’re delighted that you decided to come here and spend some time with us. I think it’s going to be a pretty fantastic day celebrating the superlative things that happen around volcanoes, and in particular the grapes that are grown and the wines that are made from them. MV: This is master sommelier John Szabo. It’s the end of March 2018 and he’s introducing an exciting inaugural event in the world of wine: the first annual Volcanic Wines International Conference. Szabo wrote the book Volcanic Wines. He also founded the group Volcanic Wines International. When you hear the term volcanic wines, you might be asking yourself the same curious question a passerby posed the first morning at the conference. JS: Volcanic wine, what the hell is that? MV: And Szabo’s answer to that question may surprise you. JS: Off the top, there’s no such thing as volcanic wine. Volcanic wine doesn’t exist, not in the singular. It is a world of infinite nuance, radiant rainbow of colors of the volcanic wine world. So it’s not volcanic wine in the singulars, it’s volcanic wines in the plural. MV: Intrigued? Listen on and you’ll hear more about the special world of wines that John Szabo and others hope will blow your mind. Our Lifestyle and Entertaining Editor Mike DeSimone attended the Volcanic Wines International Conference. During the grand tasting, when more than 50 volcanic wineries offered sips of their wares, Mike spoke with the movers and shakers in the volcanic wine world. He began by talking with John Szabo himself, who described how he decided to start shedding light on these distinctively nuanced wines. JS: I was writing an article about a decade or so ago and trying to come up with some clever angles, and started to think about some interesting wines, places I’d been to recently, for example Santorini in Greece, the northern shores of Lake Balaton in Hungary. Mount Etna, I just made a recent trip there. I was captivated by many of these wines and suddenly it dawned on me that the only thing linking them all together was the fact that they were grown on volcanic soils. So my tongue-in-cheek article turned out to be, “My Favorite Wine Grows on a Volcano,” which my editor at the time thought, “Ah that’s an interesting hook. That’s a really different take on it. 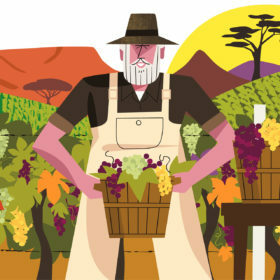 Can you expand that into a full length piece?” And as I was doing that, researching of course, discovered that there’s this incredible world of wines grown on volcanic soils literally around the world, and realized that there was something to explore further, and perhaps even turn into a book. Really, out of that, through my friendships with many people around the volcanic wine world, in particular Sofia Perpera and George Athanas, who ran, still run, Wines of Greece and Wines of Santorini. They said well, there’s something there. Why don’t we turn this into something a little bit bigger? Let’s make it a conference, let’s turn it into a, “movement,” is the word they used. It grew from there. That was about a year and a half or so ago that we started working on this project. Mike DeSimone: So, who’s here today? Who’s behind the tables pouring? What regions do we have? How many wineries and how many wines are with us? JS: We have, if I’m not mistaken, six different countries represented, sixteen different regions, about 51 wineries and over 150 wines. Starting from, say in the U.S. and moving out, we’ve got wines from Northern California, Napa, and Sonoma and Lake County. We have a winery from Chile, which is an amazingly volcanic country waiting to be discovered a little bit more. Over in the mid-Atlantic we have wines from the Azores, an archipelago that belongs to Portugal. Moving into Europe, lots to choose from there: Many, many producers from Italy, from Soave down through Campania, to Rasa, Vesuvius area, Basilicata, Monte Vettore. We have wines from Etna of course. That’s the poster child for volcanic wines these days. We have wines from Santorini, of course. We also have wines from Hungary, which many people don’t necessarily see it readily with the volcanic terroir, but I can assure you it’s an amazingly volcanic place, particularly in the northern part of the country. MDS: Is there some taste or quality that translates into the glass? JS: I would say, in my experience tasting many wines from around the world, the one thing that they tend to have in common is that they fall on the more savory side of the spectrum, as opposed to fruity wines. Many wines are fruity. Volcanic wines tend to be, by and large, very savory, very earthy, very stony, lots of herbal scents, lots of potpourri. It’s a wonderful array of unusual flavors. They’re sometimes a little bit shocking at first. If you were tasting wine for the first time I probably wouldn’t give you a glass of the most volcanic expression I could find because they’re often not soft, they’re not cuddly, they’re not warm. You don’t cozy up to them. They often have these little sharp edges: a little bit of saltiness, a little briny character. But once you fall in love with that world you’ve got an amazing world to discover. I would encourage people to go out, to inquire about, to ask about, taste as broadly as possible. I’d recommend that for anyone, just to get a sense of the amazing diversity that there is in the world of wine. For someone to go and select the same wine, the same brand, taste it day after day, for me is a bit saddening. I would love to share the fact that this is a great and diverse world. MDS: You’re obviously very passionate about wine in general and the volcanic wine. Thank you very much for sitting down and talking with us today. I really appreciate it. JS: My pleasure, absolutely. Thanks so much. Marina Vataj: You can see photos of John speaking at the conference, and check out his book Volcanic Wines by visiting our website: winemag.com/podcast. Sofia Perpera is no stranger to volcanic wines. The trained chemist and enologist directs the Greek Wine Bureau in North America and coordinates the promotional campaign for Wines From Santorini. When Perpera spoke with Mike DeSimone during the grand tasting, she shared her perspective on how the volcanic wine movement got started. Sofia Perpera: So when John had his book, and we’ve been friends with John for several years, I told him you know, let’s do something with volcanic wines from around the world because this would also benefit Santorini a lot. I mean, it would be like some of the best wines that would come together and we would push the whole category ahead. And they have so many common characteristics. So John got very excited about it and then also Gino from Colangelo and we started this movement, since this fall actually. The idea came this fall. Mike DeSimone: What have you tasted here today, or what other volcanic wines have you tried that surprised or delighted your palette? SP: I tasted some really exciting wines from Azores, from Portugal. From Italy, I tasted several from Soave. But there’s lots more that I will taste. MDS: What will you say are the similarities or differences about those wines, as compared to the Santorini wines that you’re familiar with? SP: Well, Santorini wines are not very romantic. They are known for their great structure, great acidity. They’re like a punch in the mouth. They’re strong wines. I tried now some very nice wines from Soave that are much more, the whites, that are much more romantic. They’re elegant wines. They’re not so acidic, but they’re completely different. Yet, they have an earthiness still. They’re also food wines. I tried some wines from Azores that were so elegant and very delicate. I wouldn’t say natural because I don’t like the term but, they seemed that they were wines without much interference. MDS: On your dream list as this volcanic wine movement grows, who else would you like to see here next year? SP: We’d like to get, even from the regions that we are now, to get more wineries. We’d like to get wines from Canary Islands. I mean, more from Italy and, we don’t have any wines from Germany. We’d like to get some wines from there. MDS: So the other thing I wanted to know, is how do we get people, how do we tell people, besides saying “This grows in volcanic soil,” what do we say to people to make them excited enough to want to try volcanic wines? SP: First of all, everything about wine, it’s not just a drink that you have in a glass. It’s the whole story about it. It’s the people, it’s the culture, it’s the place. And we plan on organizing some trips in several regions like that, because that’s when you get the feel, you get to understand the quality of the wine. Bring all these regions together, organize educational events, and have fun! MDS: Okay great. Thank you. Marina Vataj: While we can’t offer you any tastes from the grand tastings, we can offer you some sights. To see photos of the tasting and to read more about Sofia Perpera’s work with the Greek Wine Bureau, visit our website: winemag.com/podcast. Time for a break, but when we get back: perspectives from three different regions of volcanic wine. Maria Brunn: Just north of Napa, over the other side of the Mayacamas Range, you’ll see Lake County. Christina Boutari: Santorini is one of the most important wine regions of Greece. Alessio Inama: Verona, northeast of Italy. In a small area called Soave Classico. MV: It’s coming up on the wine enthusiast podcast. Ben Gordon: People have studied volcanoes at school. People kind of have this idea of this majestic, unknown beast that is a natural disaster potentially about to happen, and from a wine making point of view, make wines that are really unique. Something different out there on the shelf. And there’s a real kind of minerality and underlying quality to them. It’s not just about fruit; there’s something else there, and that’s what you’re going to get in this room. Georgia Harrison: Volcanic wines are so terroir specific and they’re so expressive but so individual. I cannot get enough. Robert Gilvesy: This minerality that we feel, whether you call it minerality or, what you want to call it. It sometimes ends in a salty finish, and that’s why we say salt of the earth is a perfect expression for this in many ways, about what the volcanic wines are about. Lindsay Tsirlin: These wines really have to struggle, and they really have to kind of evolve to be something truly unique. Especially the wines from Santorini, because the landscape, it really is so lunar and the fact that anything can survive there at all is astounding. Franco Zanovelli: We think it’s something that is not only a good way to promote in a different way with wine, but is really a matter of different wines. Wines that are full of particular character, very modern wines. Panaylota Kalogeropoulou: With all this education and study on the volcanic soil, it’s something that for sure has a long lasting living, like the flavor of the volcanic wines. Marina Vataj: As John Szabo pointed out earlier in the show, you’ll find volcanic wines from a variety of countries around the world. Lifestyle and entertaining editor Mike DeSimone poured a glass with experts from three of those countries: the United States, Italy, and Greece. Maria Brunn: I’m Maria Brunn. I’m the executive director for the Lake County Winery Association up in Lake County, California. Mike DeSimone: When visitors come, describe the landscape to me. What will we see that might make us realize we’re in a volcanic region? MB: Well, the very first thing you’ll notice when you come over the mountains is the red dirt. Lake County’s at about 1,400-feet elevation, and it is primarily all red volcanic soil. And then you’ll see the mountains rising up around. Mount Kinocti is the dormant volcano in the region. It’s beautiful to hike up there, and you can look down and see all the vineyards and the lake and it’s just gorgeous. MDS: So Lake County got it’s name because there is a lake there, is that right? MB: Correct. Clear Lake. It’s the oldest volcanic lake in the United States. MDS: Really? Do you know what the age is? Do you have any idea? MB: It’s about 2 million years old. MDS: Wow that’s cool. So how many wineries do you have all together? How many belong to your organization? MB: So, right now we have 36 winery members, and then there are about 180 vineyards in the region growing fruit. About 9000, almost 10,000 acres planted. Andy Beckstoffer is of course a huge holder up there with his cabernet program. MDS: Cool. So you brought over a glass of wine from Lake County for me to drink. Why don’t you tell me what it is that we have here. MB: In front of us right now we have the 2010 Hawk and Horse Cabernet Sauvignon. It’s from the Red Hills Lake County AVA. I’ve been up on a vineyard tour. They have two separate vineyard sites. One’s at a little lower elevation, then they have one that’s at 2200 feet. They’re on these gently rolling hills, and from up there you’ve got the red soil, you’ve got these beautiful little crystals that pop up. They’re called Lake County diamonds. They’re biodynamically farmed. They were the first in Lake County, I believe. From day one they were organic and biodynamic and they’ve worked really hard to just craft these beautiful Cabernets. MDS: So let’s give this a taste. It’s a nice Cabernet. So Maria, what would you eat with that? MB: To be honest, I would pair this with a beautifully rare steak. It would also go really well with charcuterie. You could sit and drink this, honestly in the afternoon. It’s so nicely made. It’s so well balanced. MDS: You know what, you got me there. So actually, cause I think of charcuterie, that’s kind of like Italian breakfast, and our bacon cheeseburger is our lunch, and then we’ll have that rare steak for dinner. It sounds like we have our day all set, what do you think? MB: I think that sounds like a great plan. MDS: All right, terrific. Thank you. Alessio Inama: Hello everybody. My name is Alessio Inama. I’m part of the Inama d’Agricola. We are a family business. I’m part of the third generation, actually. My family has been cultivating in Soave Classico since the 60s. My grandfather started the whole operation, and now as a brand, as a bottle, Inama, we are working since 25 years. Mike DeSimone: So can you tell me, what effect does the volcanic soil have on the grapes? Is there actually something we can taste in the wine that we can attribute to the volcanic soil? AI: I would say that what is called minerality is very difficult to understand, especially in the grapes. What you get from the volcanic soil is simply, very nice and refreshing feeling that kind of clears the palate and makes your mouth ready for the next bite, for the next flavor. So wine made from volcanic soil is a very food friendly wine. MDS: So describe for me, what do your vineyards look like, and looking at it, what clues would I see that the soil was volcanic? AI: We are just in the heart of the Soave Classico, on a cru called Monte Foscarino which is the tallest mountain in the Soave Classico. So wherever you see Soave Classico, you will see the Monte Foscarino in the middle, in the heart, dominating all the rest. Most of all, our vineyards are on what is called the ash of the volcano. Some other areas have more, like the proper basaltic lava. Some other areas have what is called tuff, white tuff. So even in the Soave Classico there are different crews with different position and different volcanic soils. Our vineyards are normally between 40 and 45 years old, and they’re southeast facing, which is fantastic. Actually, in the beginning when my grandfather started to buy parts of land, the best plots were the ones facing west, because they were getting more ripened. But now with the climate change, we can see on the west side they are not the best ones. On the east side is much better. We are very proud of our vineyards. MDS: So you brought over a couple of glasses of wine for me. What do we have here? AI: Okay, we start with the Vigneti di Foscarino, which is our classic reserve. It’s a selection of the oldest vines of the property. It’s kind of a, for us, it’s the traditional Soave. We do skin conscious maceration and then six months in used barriques. So what is the result is a wine with a lot of complexity and a lot of structure as well. We do classic notes of Gargenega. We did kind of a final after taste of almond. It closes very nice. It’s a wine that you really enjoy every day, every time of the day. MDS: That sounds great. And what’s the other wine that we have here? AI: I brought something kind of special. This is the most celebrated wine of my estate, and almost also now in Italy. It’s a crazy wine. It’s a Sauvignon Blanc that in a blind tasting, nobody would recognize it as a Sauvignon Blanc. This is because in a very strong personality, soil, and terroir as Soave Classico, it’s the terroir that dominates the variety. When you taste this wine, you don’t get any of the varietal aspects of the Sauvignon Blanc, but you get something completely different. You get the minerality and the floral notes of the Soave but with something more going on that is coming from the Sauvignon Blanc. This particular wine actually, what we do, we do six months in heavy toasted barriques that gives this kind of filmy feeling. It’s an extreme wine. It’s a unique wine. It’s something that you really can not get anywhere else in the world. It can match with the most strong flavored dishes that you can have. MDS: Okay, well lets give that a try. Cheers. I will agree with you. I will say I would not immediately have picked that out as being Sauvignon Blanc. If I did, I mean it definitely, I think a lot of people are used to those fruity, fresh, citrusy, New Zealand Sauvignon Blancs especially, and this is a much more sophisticated taste than that. How much of that, of the sophistication, can we attribute to the wood? And how much do you think we can attribute to the volcanic soil that it’s grown in? AI: I think 50-50 actually. It would be interesting to taste also the Sauvignon Blanc that we do only from stainless steel. Then you will see the difference. The one that’s from the steel is already something that you don’t feel is a Sauvignon Blanc. I usually say these are Sauvignon Blanc for people who hate Sauvignon Blanc, because it tastes of something else. It’s more tropical. It has this huge minerality caused by the volcanic soil. But then, the sophistication as you say of the wood kind of combines and creates something even more different and more creative. So when we talk about terroir, I always like to think about the terroir as an expression of the human mind, and the ambition of a man who wants to interpret this terroir and create something. MDS: Great, all right, well thank you very much. I really appreciate it. AI: It’s a pleasure to have you here, to be here, and hope to see you soon. Ciao. Christina Boutari: Hello, I am Christina Boutari. I am the Boutari ambassador for the wines of my family here in the United States. I’m the fifth generation of the family. The family started in 1879. Mike DeSimone: Tell me what is so special about Santorini as a grape-growing destination. CB: When I usually go to tastings and talk about Santorini, I feel very unique talking about the volcanic island, but here today, we’re in a room where every wine is from a volcanic region. But this is what makes these wines unique. So there is a volcano. They’re active or non-active on the island that has very important effects on the soil and then on the grapes grown on the island. Also, not only in terms of how they are grown, in terms of how old they are, in terms of the wines they produce. So Assyrtiko is the main white grape that is grown on Santorini, on the island. That’s 75% of the island is covered by Assyrtiko the white grape. And you can have dry white wines from Assyrtiko, completely stainless steel wines, or you can have aged, oaked wines. Or you can have the famous Vinsanto from Santorini. MDS: So when we taste the Assyrtiko from Boutari would you actually call it Santorini, is that right? CB: Yes, we call it Boutari, Santorini. And it’s very representative of the region and of the island and of the wines. The typical stainless steel, 100% Assyrtiko of Santorini. MDS: And I think we are going to taste that right now, so cheers. MDS: So that is the hallmark of what an Assyrtiko tastes like. It’s crisp, it’s clean, it has the citrus, there’s some lemon. It’s actually making the back of my mouth…it’s making me pucker up a little bit. In terms of what I’m feeling, the mouth feel and the taste, what of that can we attribute to the volcanic soil that the Assyrtiko grapes are grown in? CB: So, what I’ve always found, the Assyrtiko, because in Greece you can find Assyrtiko in other regions but it’s never a taste like the Assyrtiko from Santorini, because of the soil. And I learned some things today as well, like the minerals of the soil, the salinity that these minerals give to the wine… Santorini I think has even more salinity because it’s in the middle of the Aegean and it does get the mist that really helps to moist the grapes, the vines, but also give it the salinity, the feeling. High acidity. These vines struggle. They really go really deep in the ground to produce these grapes. So you have wines that have this very metallic, mineral… And you see that struggle I think in the wine, as much as poetic as that might sound I think you can feel that in Santorini. That’s what’s fascinating about Santorini, and most volcanic wines I guess. I’ll tell you a story a little bit about Santorini. A lot of people think of Greece as white and blue. Indeed the houses are white, the sea is blue, the skies are blue obviously. But Santorini is also black because you have the lava, you have the lava rocks, the beaches are black. And then as you see those wines, you see some labels, like our labels are black and white. You see that strength, that boldness in these wines. It’s really true to the region, to the place. MDS: That’s a very picturesque and beautiful way to describe the volcanic soil of Santorini. Christina, thank you very much. Marina Vataj: That’s it for today’s Wine Enthusiast Podcast. Big thanks to Mike DeSimone for reporting from the first annual Volcanic Wines International Conference in New York City. You can read more about volcanic wines and the volcanic wine movement on our website: winemag.com/podcast. You can subscribe to the Wine Enthusiast Podcast on Apple Podcasts, Stitcher, or wherever you get your podcasts. And please, write us a review. We love to hear what you think. We’d also love to stay in touch. Follow Wine Enthusiast Magazine on Facebook and Twitter. Use the #WEPodcast. And visit our website: winemag.com/podcast. The Wine Enthusiast Podcast is produced by Sheir and Shim, LLC. I’m Marina Vataj. See you next time!